They're not legal for cb. Cbs need to be approved. So what to do with it? If you just want a cb get a cb and sell it to a ham. But if you want to tinker, become a foundation license ham. It's easily done over a couple of weekends. I don't understand what you are saying. Punctuation is your friend. Might also turn on the VHF set *flicks switch* and listen out on the vhf repeaters (analogue). Well I'm looking at getting my foundation and maybe standard license over the next few weeks when I'm training down in Hobart. I've emailed a club in Hobart about it but so far now reply. As I am off to Antarctica late October for a year if I can get the license sorted in time and anybody wants to have a chat with someone on the icy continent let me know. Very cool. Are you heading down in a telecoms role? A bloke I work with went to VK0 a while back, I think he said that the station equipment was not meant to be used for amateur ops, so you may need to count on taking your own equipment, unless you're close to the radio department. Definitely get your licence before going - not many people get to hold a VK0 call. Check out the Radio & Electronic School - www.res.net.au, they have free apps you can download for the Foundation licence, but you'd *really* want to go for a standard for the additional operating privileges it gives you. Still time to get it done before October - I'm sure you could even finish it off remotely if required. Ive made contact with the amateur radio club in hobart so hopefully I'll catch up with them on Wednesday night and see what we can do. My role down south is instrument electrician but I should be able to get on well with the comms guys. I start on Wednesday morning so I will have a chat to one of the engineers at work and see what's required to operate down south. My parents recently purchased an old RFDS Radio Base. Was having a look in the attic and found about 200 oldvalve amplifiers. There are different types and brands - here's a photo of a Mullard. Basically wanted to know if these would have any value and use to anyone. Next time I am up I'll rescue the rest of them. If anyone wants to know which is best, the 7300 hands down. And this is coming from someone keen on 2 & 70 SSB operation. I've applied to do the standard course in Feb with ham college. Haven't been very active lately but next year in my own place will be better. I am still playing around with scanners, now focusing on traffic analysis. I'm still playing radio - but atm I am toying with solar. Bought two panels, a shitload of kindly treated batteries (19 55aH units) and a charge controller. Will look for a non noisy inverter for the appliances, and a quiet DC-DC converter to run the radios. 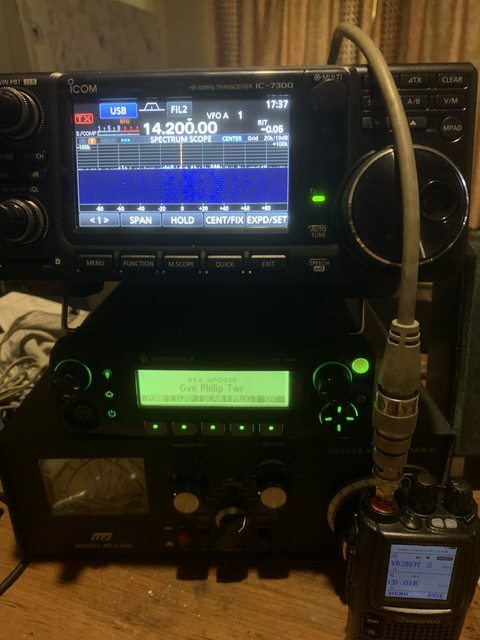 30A should do it - run both the HF, vhf and uhf all at once, and still have current to spare to run the desk lamp (LED) and tx on any single radio without compromising the other 12V items. I have almost completely given up on the hobby. It's inacessable for me, can't get any signals anywhere. can't go anywehre where I could. Equipment too expensive, and living inner city rentals where owners and housemates just don't understand things. And even if I do manage to get online and setup it seems to be completely dead air here in WA. I was getting into the digital modes and SDR's but again I was struggling to get anything out of the hobby in return. I have since let my membership with WIA lapse. But i continue to keep my license with ACMA up to date and paid as it's an absolute pain in the arse having to get it back again. Mate, the foundation test is pretty easy and doing a course through a reputable club will get you the license. Have a look at the local clubs/ARV for details. You don't need a permanent antenna tower, so you can make that discussion with the better half a bit easier. Warning, the equipment is fairly expensive, especially from reputable Australian suppliers. Top is IC 7300, Middle is XTL 2500 motorola hacked to believe its an XTL 5000, and the bottom is a big old manual antenna tuner that will tune a piece of wet string In front of the tuner is the little Wouxon handheld, which is programed with all the repeaters in australia (3000 memories), and uhf CB RX.